From the Artist: “I will establish his line forever, and his throne as the days of the heavens” (Psalm 89:29). This psalm, chosen from the feast of St. Joseph, reiterates Nathan’s prophecy to King David in the second book of Samuel, chapter 7. A prophecy that is fulfilled in Joseph and Jesus. 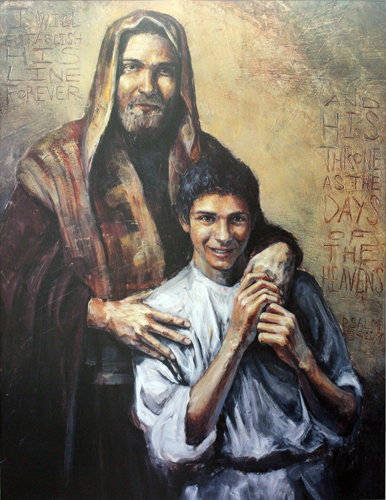 While preparing for this painting, my thoughts moved steadily toward a vision that would address this legacy while gently revealing the reality of Joseph as the man chosen from the beginning of time to be the earthly father of God’s only Son. I saw an image that spoke not only of the magnitude of this relationship, but also of the closeness and intimacy they must have shared.